(Africa News) — Ethiopia’s prime minister, Abiy Ahmed has ruled out the formation of a transition government, and urged the opposition to prepare to contest at the polls that are just two years away. 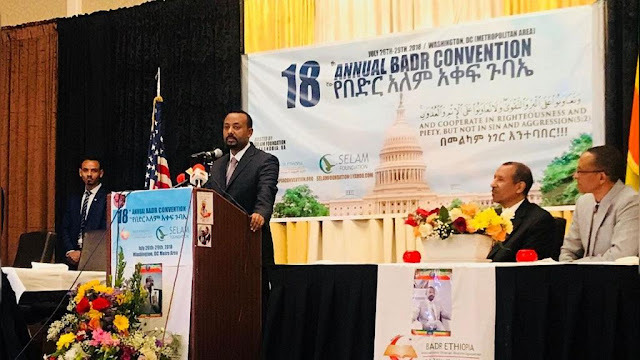 Abiy, who was addressing the 18th Annual Badr Convention organized by Ethiopian Muslims in the United States, who said the ruling EPRDF party is working hard to compete in a democratic environment. “My ultimate goal is to ensure a democratic election takes place in Ethiopia,” said Abiy. Abiy is in the United States to mobilise support for ongoing reforms that he has championed since taking office in April this year. The 41 year old former intelligence officer has met several opposition leaders, agreed to amend the country’s controversial anti-terrorism laws and also granted amnesty to individuals and organisations that previously rebelled against the government. The reforms have yielded positive results, as organisations like Ginbot 7, ODF and ONLF have renounced rebellion and committed to pursuing a peaceful struggle in Ethiopia. Abiy also addressed Ethiopian political parties at a forum in Washington DC, urging them to get organised and participate in a peaceful process of democratic discourse.